The Better Naito project made access to the 2015 waterfront Festivals safer and easier for all Oregonians. A one mile stretch of Naito Parkway was re-imagined, created increased accessibility to the Rose and Brew Festival for people walking, biking, and getting around downtown. Image courtesy of BBPSU. 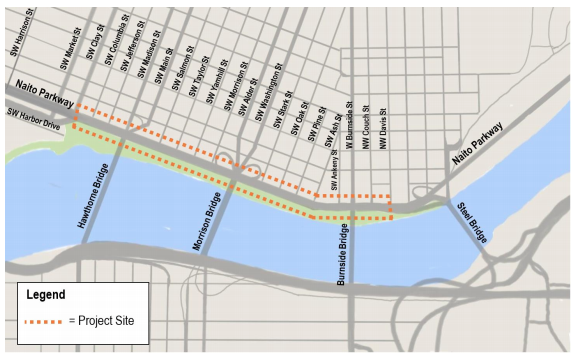 During Festival season, people visiting Tom McCall Waterfront Park (denoted in green) are often forced directly into traffic on Naito Parkway. For example, here is BikePortland’s coverage of the Cinco de Mayo Festival earlier this year. The Better Naito pilot project offered people walking and on bikes a protected space, instead of mixing people, bikes, and cars in the street. Better Naito was a collaboration between Better Block PDX, Better Block PSU, PBOT, and Commissioner Steve Novick’s office. Throughout the project, the Portland Bureau of Transportation gathered data by field observations from volunteers as well as Bluetooth, video, and manual counts. The average change in cyclist use of the lane was 31.5% on average in the evening, and 16.8% in the morning. This represents the amount of cyclists channeled away from pedestrian areas in the Tom McCall Waterfront Park. 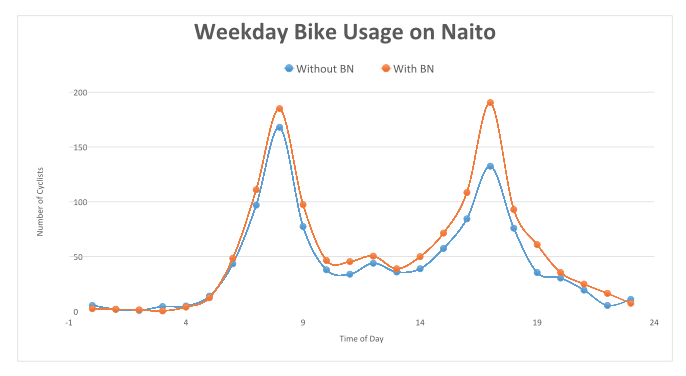 The number of cyclists is the average of the two days for each set of numbers (with and without BN). Counts are taken from the tube counters located at SW Naito and Salmon Ave. Better Block and Portland Bureau of Transportation gathered live public feedback through the Twitter hashtag #BetterNaito, as well as an email address and hotline. Anyone could voice their opinion, report conditions, or post pictures. 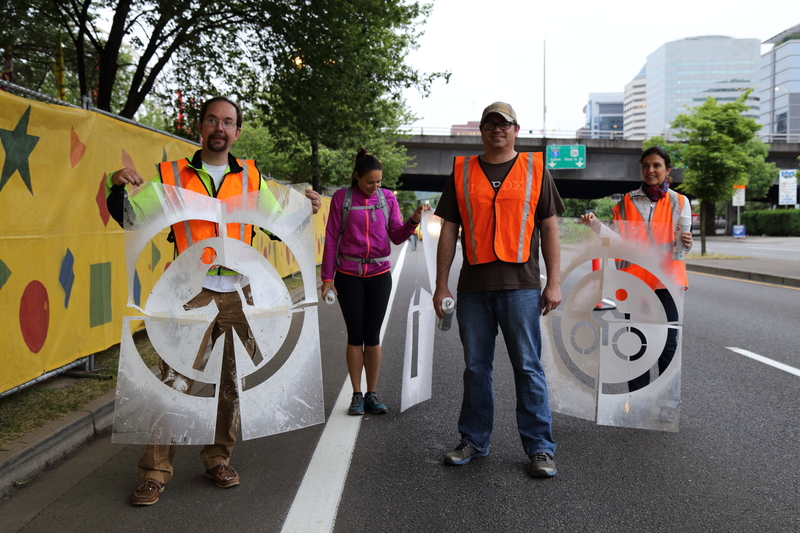 Volunteers from all over Portland came to set up the bicycle and pedestrian lane at 4 o’clock in the morning.